After work, my editor, Mort Weisinger, would take us to dinner. I’d never been in a restaurant that had tablecloths on the tables before, and precious few of the other kind, for that matter. Mort took great delight correcting me when I picked up the wrong fork. It was a lesson in establishing characters—he was the big, important V.P. Editor from New York and I was the young bumpkin. I didn’t even mind. The whole thing was like a dream. Now, to the point. 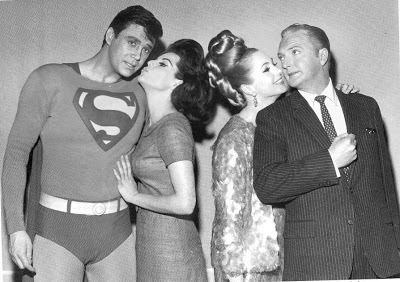 One evening, Mort took us to the Alvin Theater to see the Broadway play It’s a Bird, It’s a Plane, It’s Superman. Mort played a part in getting the show licensed. The way he told it, he was responsible for all such things, including the Batman TV show. All I know is that we got VIP treatment. Somewhere in the middle, a very mild, sexual innuendo joke was made, the only one in the play. Everyone laughed except my mother. She turned to Mort, my boss, and asked why everyone laughed. And there, in the Alvin Theater, in the middle of It’s a Bird, It’s a Plane, It’s Superman, my boss was explaining, with some difficulty, to my naïve, unworldly mother in her homemade dress, facts of life stuff. But, no. I quickly got over it. It was another lesson in character, I decided, like the fork thing, though Mort was more polite to my mother than he was to me. She was who she was, got that way honestly, and had every right to be that way. Naïve church lady? Okay. I was okay with that. Through this incident an element of her character was revealed. And Mort’s as well. And maybe I grew up a little in that moment, too. All very instructional for the kid who wanted to be a writer. Besides, the play sort of echoed the incident. It was, after all, about naïve Superman versus clever and sophisticated Max Mencken (Jack Cassidy) and brilliant, bitter Dr. Abner Sedgewick (Michael O’Sullivan). And, besides, I was really enjoying the play. Like I said, the whole thing was like a dream. After the show, Mort led us around to the stage door, knocked, and we were welcomed in. The fellow at the door obviously knew Mort and treated him like a big shot. 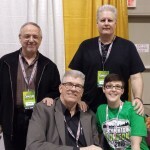 I also got to meet, or at least exchange greetings with Jack Cassidy, Linda Lavin (Sydney) and Patricia Marand (Lois Lane). They showed me how Superman flew. In each scene in which he flew, a stagehand holding a cable would be hiding behind some item on the set—a piece of furniture, whatever. 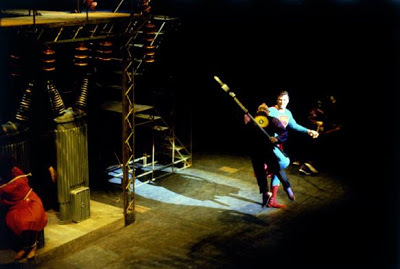 Just before it was time to fly, Superman would conveniently stand near the hiding place and, unseen by the audience, the stagehand would clip the cable to the harness he wore. At the other end of the cable, atop a tower of sorts offstage, a very large heavy man would jump off when the time was right, holding the cable (I’m guessing, but I suspect it was otherwise secured to him as well). The large man went straight down and Superman went up and away. Ancient technology. No major accidents, as with the recent Spider-Man show, but they told me that one time, the cable slipped out of the stagehand’s grip and swung to the middle of the stage. Superman apparently just walked it back over and handed it to him, never missing a beat. Mort took us back to the Summit in a cab. A highlight reel night. Like a dream. 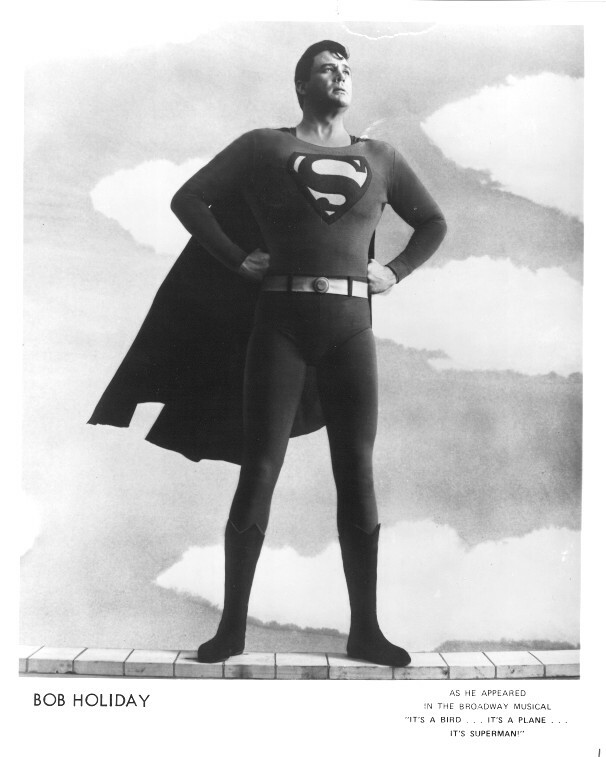 It’s a Bird, It’s a Plane, It’s Superman sound track available on Amazon. That's what surprised me about those two photos I mentioned: they don't have the polish of photos taken during the dress and tech rehearsals. They look like candids, particularly the one of Superman and the villain in the spotlight. 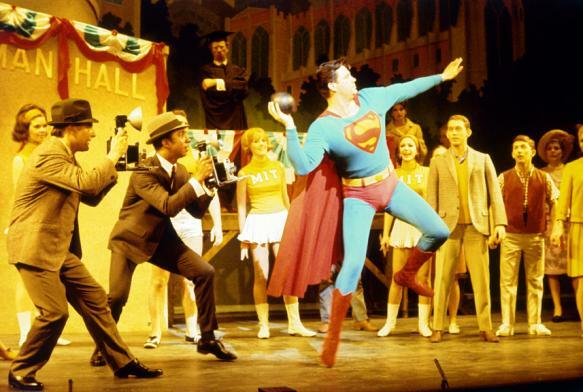 I suppose when your resume as producer and director includes West Side Story, Cabaret, Phantom of the Opera, Evita and Show Boat, Superman might well be considered a flop at a paltry 129 performances. Even (now) lesser known Hal Prince musicals like Baker Street did better. I'm a huge nerd for It's a Bird, It's a Plane, It's Superman. I was born three years after it was on Broadway, but like you JayJay I have been fascinated by it and have collected material about it over the years and know the songs from the soundtrack. I'm hugely envious Jim went, much less got backstage. Photos of Broadway shows are generally taken during rehearsals, especially the tech and dress rehearsals. A Broadway show is technically considered a "hit" if it breaks even or better. Superman was technically a hit, but a flop by producer Hal Prince's lofty standards. He told me so himself when I visited his office in 1987 or 1988 after I'd been hired by John Flaxman of the Hal Prince organization to write the story and script for a Star Wars musical. Backers included John Roche (Blade Runner financier) and toy industry/licensing legend Stan Weston. Weston is the one who got me the gig. The show was never produced because of licensing difficulties with Lucasfilms. I believe at the time there was a lot of hoopla about the show. I worked in theater briefly, making costumes, and had a few old theater magazines from the 60's that the library got rid of. They were full of praise for the show and had photos. Those magazines are long gone, but when I met Jim and we spoke about the show I had thought it was a big hit on Broadway. I was shocked when the producer told him it wasn't considered a hit. But there had to be loads of pictures taken to promote the show. I don't remember the web sites I found these photos on because I found them years ago. I have been fascinated by the play and usually gathered up material whenever I could. I put the best of it here. Hi JayJay – Really? Because two of them (Superman shotputting and the one with the villain) I've never seen before and they look like they were candid shots done from the audience! Those photos are just some pictures I found on a web site about the show and borrowed. 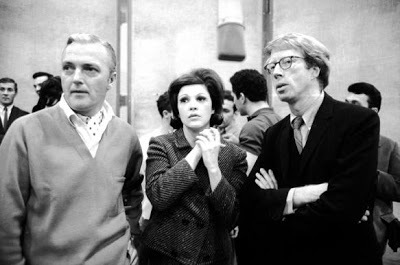 A question I've been meaning to ask Jim: are the two colour photos of the action on stage actual snaps you took while watching the play in 1966? If not where did they come from? Check out a book called the "Ten Best Plays of 1966." published by Dodd, Mead. Many libraries have these "Best Plays" books. The photos and descriptions of IABIAPIS tell you everything you need to know. The word "saucy" comes to mind re: Sidney as played by Linda Lavin on Broadway. Hi Jim, i'm studying musical theatre and I was given the song "you've got possibilities" to perform…I can't seem to find any information about the show online…would you describe Sydney for me? What's the character like in the play? This will help me a lot. Thanks! Linda Lavin has retired (well, as much as anyone who still performs on Broadway, or gets to work on Arthur Miller's final production can be called retired) here in Wilmington, NC. We have a lively arts scene, combined with the film and television work that goes on here, and she has her own theatre where she performs occasionally. While I haven't yet worked with her, I will endeavor to let her know that she's been mentioned with a cute picture from the show. Loving the lessons and memories, thanks to Jim and JayJay. If you mean the shot of Bob Holliday sort of saluting, yes, that's it, but mine is black and white. I highly recommend The Great Comic Book Heroes. When I was a kid I had an LP of Superman audio adventures – IIRC two Superman stories* and a Superboy story. On the back was a photograph of Bob Holiday as Superman that may have been the one you show here. I think he provided the voice as well. 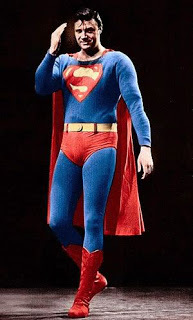 Until Christopher Reeve came along he was THE live-action image of Superman to me. I haven't thought of that LP in years, would love to have it back again. *Imagine my pleased surprise a few years later when my parents got me Jules Feiffer's 'The Great Comic Book Heroes' and the Superman story included there was one that had been dramatized verbatim on that album! THAT I do still have. The Batman TV show used several original villains. Egghead & Shane were both created for the TV show if I'm not mistaken. Thanks for your reply. I had been wondering if Mort explained licensing to you right before that play. Nowadays, it would save money to avoid using the George Pérez armor suit version of Luthor. I'm fine with original characters if they don't overlap with existing ones: e.g., La Maestra in your "Night of Doom" couldn't be replaced by anyone from the comics. Ditto for Max Mencken in this production. Jimmy Olsen couldn't sub for him. The 1966 Batman show had a lot of villains that I don't remember from the comics: e.g., Egghead (no relation to Henry Pym's enemy, of course), King Tut (not in the comics until 2009), and Louie the Lilac. I'd like to read your story about writing a script for the Batman TV series. Was it a challenge to switch from comics layouts to shooting script format? I don't know for sure, of course, but in a Hal Prince production, cost-saving that way doesn't seem likely. It was almost certainly an artistic decision. They didn't use Jimmie Olsen either. Besides, in those days, it wouldn't have saved money anyway to leave Luthor out. As far as I know, and Mort spent some time explaining such things to me, DC licensed the whole property for media, not character by character. You'll note that the Batman TV show used a wide selection of Batman villains. Did they ever use an original villain? I've never seen a performance of this play, but now I wish I did. Still, nothing on stage can compare to what you experienced. You had the maturity to understand you were receiving, as you put it, "lessons in character." The lessons never end for a writer. Life is a class that never goes out of session. Thank you for sharing your very real dream with us. BTW, why did the play have Sedgwick instead of Luthor? When a property like Superman is licensed, do licenses normally encompass all characters associated with that property, or are characters licensed one by one? I am wondering if the use of an original villain was intended to be a cost-saving move.